Chinese area rugs are distinctive and unique among most other Oriental rugs for a number of reasons. Their style, color, motifs and patterns all stand outside the norm for area rugs created in other Eastern and Near Eastern countries. Below is a guide to colors, shapes, motifs and patterns common in Chinese area rugs to help you in your choices. Of all the Orientals, Chinese area rugs are the most likely to be round in shape. That is not to say that round is the predominant shape for Chinese area rugs – rather, that a round area rug is more likely to be of Chinese design than from any other region. 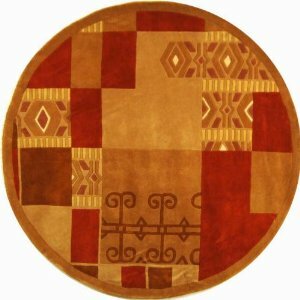 Often, a round Chinese area rug will center its design around a central medallion that incorporates a symbol of some sort. Common background colors for Chinese area rugs are white, beige, yellow, ivory, pink, apricot and peach. Yellow is one of the most common, as it denotes royalty and symbolizes power. Blue, white and pink are common colors for the working of motifs in Chinese area rugs. Overall, Chinese area rugs tend to be done in lighter, clearer colors than most Orientals, which tend to favor rich, dark colors. This is as much because of the Chinese penchant for symbolism over decoration – most Chinese area rugs are designed with symbolic meanings rather than as simple decorative accents for a room. Unlike many other styles of Oriental rugs, Chinese area rugs are seldom designed to blend and combine separate motifs into a united overall design. More often, each motif is meant to stand on its own, and has a definite symbolic meaning. A Chinese merchant, for instance, might commission an area rug for his home that uses the symbols for prosperity and good luck, or one for his son’s marriage that was woven with a pattern of butterflies for a happy marriage and peonies for love, incorporating his wishes for his son’s life into the wedding rug. As with motifs, repeating patterns found in Chinese area rugs are often symbolic. Some of the common motifs used in repeating patterns in borders and overall designs include butterflies, birds and bats – all symbols of good luck and happiness – or squares, lozenges and other lattice work designs. A common lattice design is interlocking Chinese frets which resemble swastikas. A border of Chinese frets on Chinese area rugs symbolizes 10,000 happiness – an infinite number in Chinese symbology.